We've modified the Atom API to allow setting of arbitrary permissions by adding the special elements <blogbuilder:read-permission> and <blogbuilder:comment-permission> - these can be set to webgroups, names of groups on the blog in question, or to the special strings Anyone, Staff, Students or Alumni. We've just redeployed a new version of Warwick Blogs with a few bug fixes and changes. There has been a major new release of BlogBuilder this morning with a few new important features that users may be interested in. Users of SiteBuilder2 may be familiar with the JScript editor that is used to edit SiteBuilder pages, called TinyMCE. This editor has now been implemented into Warwick Blogs to allow users to create entries in a much more user friendly way than the current Textile2 editor. As this is a new feature and has been generally untested, this is turned off by default. To turn it on, click "Admin" in the top right hand corner of your blog's homepage, then click "Settings", and finally change the setting of "Default editor for creating new entries" to WYSIWYG Editor. All new entries that you create will then use the new editor (entries created in the WYSIWYG Editor can only be edited in the WYSIWYG editor, and the same goes for the Textile2 editor). One of our most requested features is to provide statistics for users' blogs - how many people are reading the blog, where are they coming from, which entries are most popular. Rather than create a fully featured stats package from scratch, we decided to make it easy to use Google Analytics to monitor your blog. For information on how to use this, please refer to this FAQ. As always, any comments, bug reports or notes can be posted on this blog entry or on the Blogs Forum. Many users may have noticed over the past week or so that the posting of entries has occasionally (with no real correlation to time of day or what is being posted) been extremely slow, and this has led to a few cases where people have accidentally posted two of the same entry by clicking the “Publish Now” button twice. We have made improvements to two areas which we believe may have been contributing to the problem, and have released these changes this morning onto BlogBuilder. 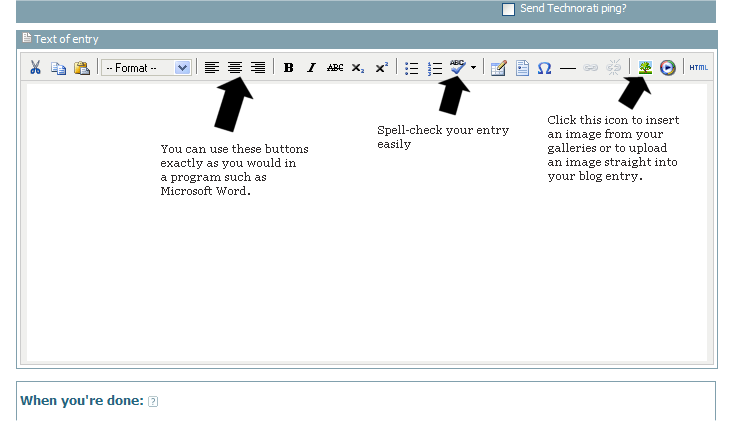 If you experience any issues with publishing an entry, for example where the entry takes more than 15 or 20 seconds to publish, then it would be extremely helpful if you could email us at blogs@warwick.ac.uk with the time of day, the content of your entry and all the settings on the “Create entry” screen (Who can see the entry, who can comment on the entry, whether the entry is show in collections, whether the entry has “Show trackbacks” and “Send Technorati ping?” checked).